Currently, the Phoenix metropolitan area feels like a huge city where you can cross city limits or boundaries and not even realize that you traveled from one city to another. It hasn’t always been that way. The growth in many cities has been explosive. 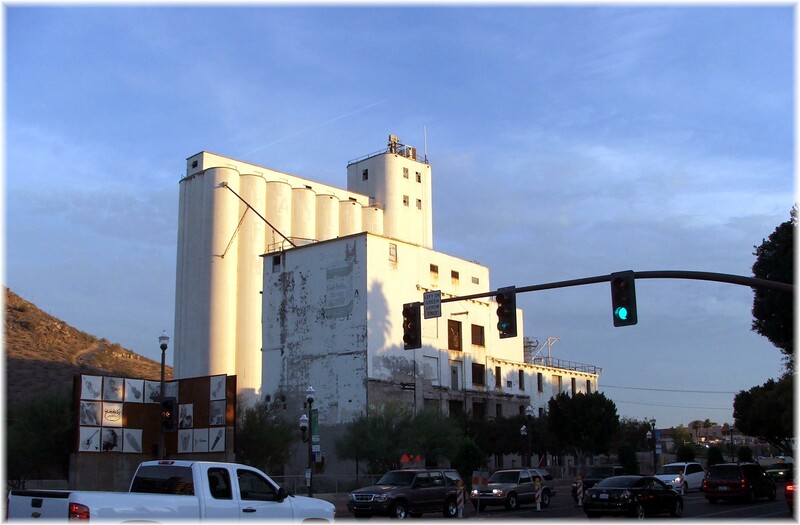 For example, according to the 1990 census, Gilbert was a small town of 29,188. Just 10 years later in 2000, the population had grown to 109,697, an increase of 275%. Current estimates for 2012 put the Gilbert population at 212,000. 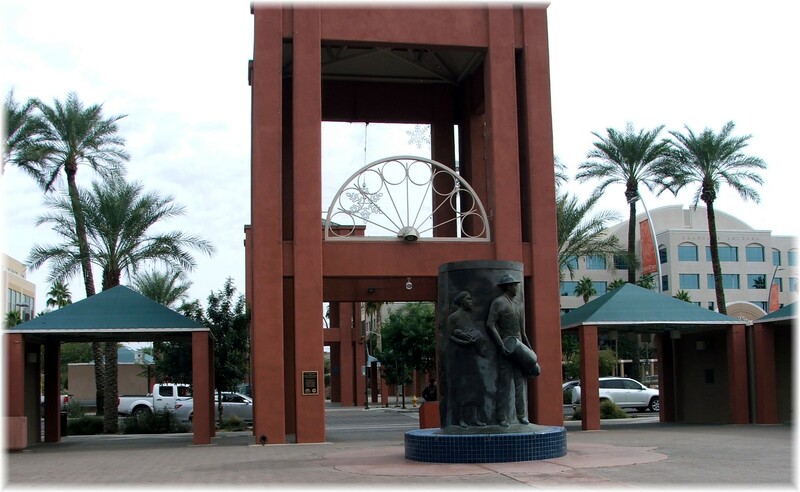 Many of the cities in the Phoenix valley were incorporated in the late 1800’s or early 1900’s when it was considered a significant distance between cities or towns. Therefore, addresses were based upon a specific crossroad or location within each community. If you really want a trivia challenge, try and identify where the addresses originate for each valley city! Start with your own. Understanding this may give you a little better insight into the relative location the next time you read an address. 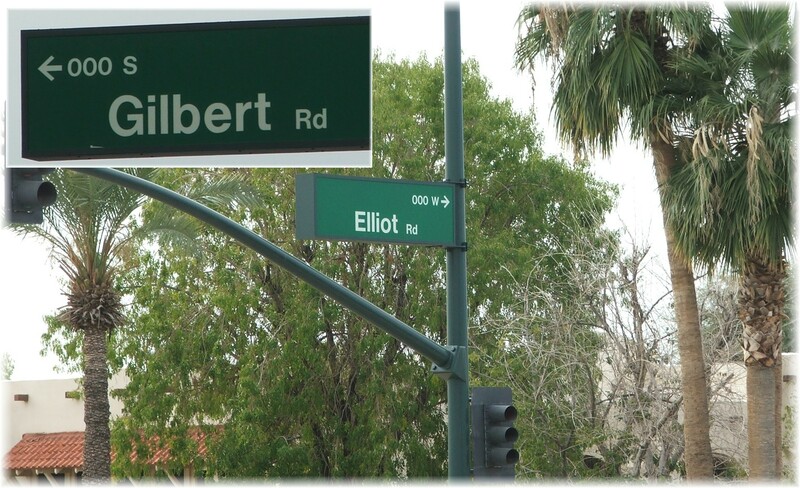 For example, the picture above shows the street signs at the intersection of Gilbert and Elliot, the zero point for Gilbert addresses. Any address on a north/south running road that is south of Elliot will be XXXX South and the name of the street. If the street runs east & west, and the house is east of Gilbert Rd., the numeric portion will be XXXX East and the name of street. Let’s turn to Tempe. You’ll notice that the street sign to the left shows coordinates of O West and O North. 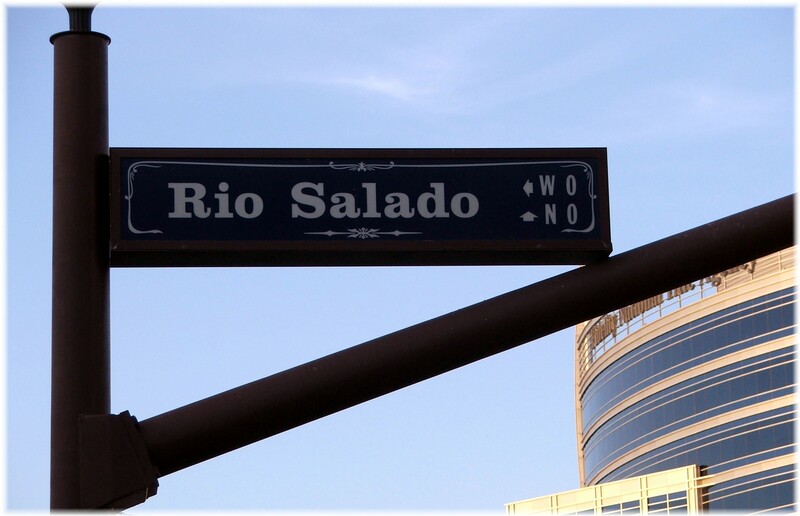 This street sign is located at the intersection of Rio Salado Parkway and Mill Ave. On this same intersection is the original house built by Tempe’s founder, Charles Trumbell Hayden, built in 1873. It is the longest continuously occupied structure in the valley. Not surprisingly, all Tempe properties look to this intersection as the origin of Tempe addresses. 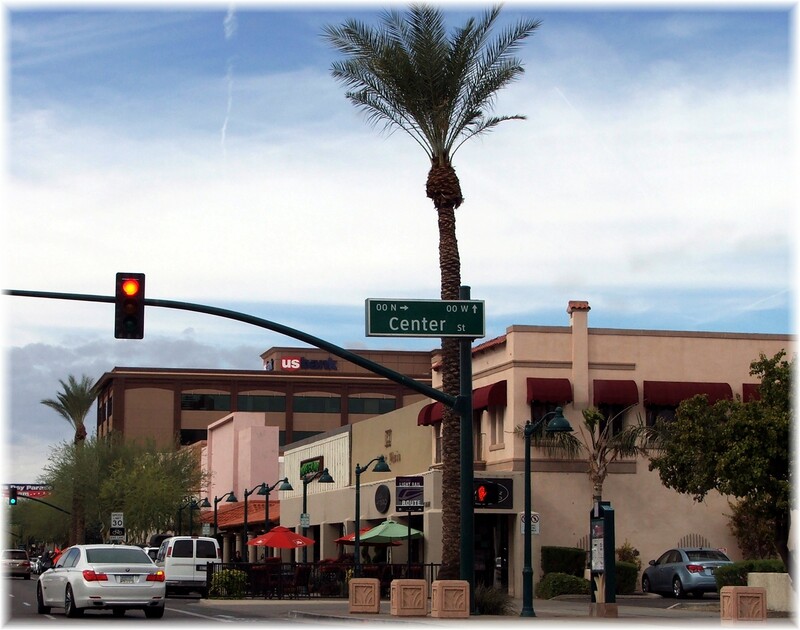 If you’re ever in downtown Chandler walking around, the zero point for all Chandler addresses is Arizona Ave. and Commonwealth Ave. in the downtown Historical area where the city of Chandler hosts many events throughout the year. So how do we get around? As you can see it would be a grand undertaking to memorize all the intersections for each city that relate to the origins for their addresses. And that is only half of the equation. You’d still need to learn and memorize the street name. When I moved to Gilbert many years ago I was surprised that in addition to the address the crossroads were frequently mentioned. Fortunately for all Phoenicians, the majority of the major arterial roads do not change names as they run through the valley cities. 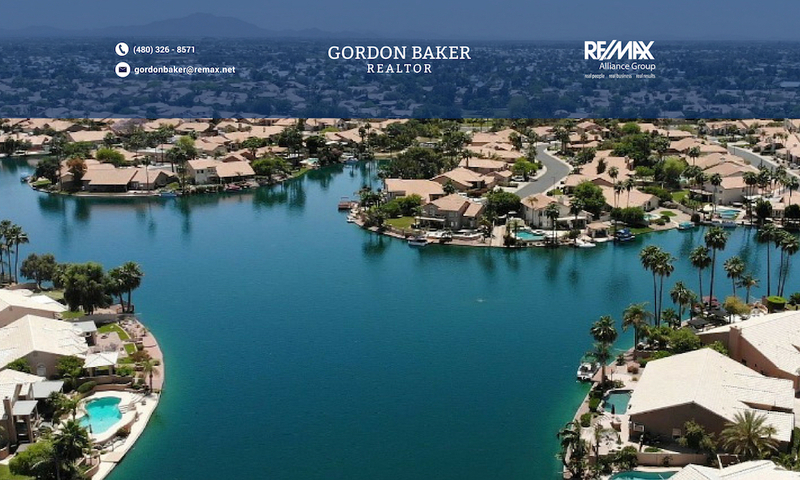 For example, Baseline Road starts in Apache Junction to the east and runs west through Mesa, Gilbert, Chandler, Tempe, Phoenix, and Laveen. Even in commericials, you’ll often hear the crossroads given in addition to the address. Obviously, there is logic to each address, but unless you’re very well acquainted with each city, you’ll find that memorizing the major arterial streets will serve you best when trying to navigate the valley. Make the popular Lyon's Gate community your home. The large great room/dining room area with entertainment niche is directly off the kitchen with staggered maple cabinets, pantry and stainless steel appliances, yes, the refrigerator conveys. Use the lower level bedroom as a guest bedroom or den. A full bathroom completes the downstairs space. The large master suite includes a walk-in closet and gorgeous master bathroom. Two large bedrooms, a full secondary bathroom and laundry room complete the upstairs areas. The upstairs and downstairs bedroom have new carpeting with tile in the remaining areas of the home. The end unit means additional privacy from the low maintenance patio area. The community pool and park are a short walking distance. LIFESTYLE MATTERS! Entertaining & Active living required! MOVE-IN-READY, ULTRA CLEAN, thoughtfully designed, featuring nearly THIRD ACRE BACKYARD OASIS PLAYGROUND. Newly renovated SELF CLEANING pool 2019, NEWER A/C, Tons of Upgrades & Options, NO HOMES BEHIND, 10' RV GATE w/cement drive front & back, Basketball Court, Outdoor Kitchen, Engineered Wood Flooring, Renovated Bathrooms w/Quartz Counter-tops, Designer Paint Lighting & Plumbing Fixtures & so much more. CHEFS KITCHEN w/mega prep area, SEAMLESS Golden Chocolate Granite (10K value) w/back splash, New SS SAMSUNG Appliances, roll-out shelves, crown molding, under-mount sink, & Raised Panel Cabinets. HOA just $32 PER MONTH, Covered & Lit Playground, Strategic Location near Shoppes & Fine Dining. GEM's like this don't last, GET HERE 1st!